Please refer to our stock # TC321 when inquiring. This is one of 2 hexagonal shaped tea cannisters which I have listed separately. This one has an incised scene of a mature bird on one side. The other side has 2 sentences from the famous Tang dynasty poem by Lu Tong. The bamboo has darkened considerably with age. 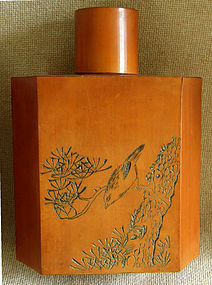 This cannister style caddy is from an estate in the US...Both the Chinese and Japanese used this shape tea cannister and Lu Tongs poems were also highly regarded in Japan, so it is possible the these tea caddies are Japanese in origin.